If you like coding in Pascal on AROS, or if you want to start doing so, you should visit ALB's blog. Famous developer Kalamatee has given countless hours of his life to AROS and the community. He's worked on many essential parts of AROS and plays a big role within the AROS world. Now it looks as if it's time to give something back, as he seems to have run out of money, even threatening his facilities to keep working on AROS. Send him some money! Popular AROS distro "Icaros Desktop" version 2.2, after having been pre-released around christmas last year, has now been officially released. 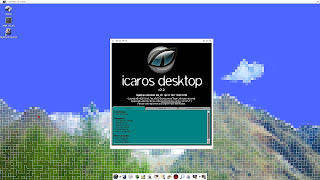 Changes include new feature "HostBridge" (run Linux/Windows applications from AROS when running hosted under Linux/Windows), a completely new look of Icaros Desktop including Magellan toolbars and decoration, placement of some tools, and other enhancements over the christmas pre-release version.